The Orchard of Various Fruits was originally the breeding garden of the Tropical Botanical Garden of Xishuangbanna. It was first established in 1960 and it occupied an area of 5 hectares. After the horticultural construction from 1997 to 1998, it is now constructed into a popular science garden integrating the preservation of fruit varieties, research on horticulture of orchards and horticultural management into one. The Orchard of Various Fruits collected the majority of rare tropical fruits in all over the world. It has 242 varieties of fruit trees, such as the "queen of tropical fruits�mangosteen (Garcinia mangostsna) , "king of drinks"passion flower ( Passiflora caerulea Linn), red and brilliant rambutan (Nephelium lappaceum Linn. ), luscious sapodilla(Manilkara zapota (Linn.) 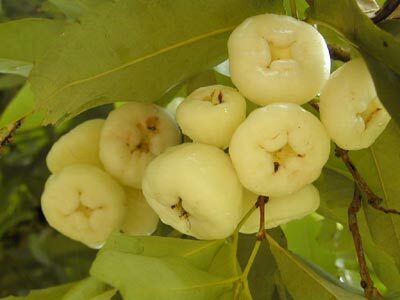 Van Royen), the sanitarian fruit alligator pear(Persea americana Mill. ), miracle mruit(Synsepaium dulcificum Denill)that could change the sense of smell, the fragrant terap (Artocapus champeden), and west Indian cherry（Malpighia glabra L.） with high Vitamin contents etc; it also introduced many eminent varieties such as baoli pineapple(Ananas comosus) etc. The garden has become a major radiation source for the popularization of eminent tropical fruit varieties. Among the eminent grapefruits cultivated by the garden, "Mansailong"and "Menglunzao"promoted the development of the fruit industry in South Yunnan, and the Passion Flower, which is developed and promoted in the society, after joint efforts of the enterprise and people in all walks of the society, has become a new industry integrating planting, processing, and sales into one.